Matthias Grünewald, c.1475-1528, whose real name was Mathis Gothart, called Nithart or Neithardt, was a major figure in a generation of great northern German Renaissance painters that also included Albrecht Dürer, Lucas Cranach, and Albrecht Altdorfer. Grünewald remained relatively unknown until the 20th century; only about 13 of his paintings and some drawings survive. 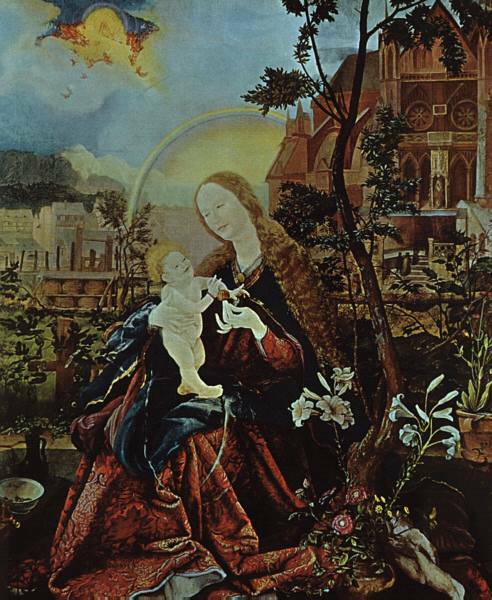 His present worldwide reputation, however, is based chiefly on his greatest masterpiece, the Isenheim Altarpiece (c.1513-15), which was long believed to have been painted by Dürer. Grünewald grew up in Würzburg near Nuremberg, and from 1501 until 1521 he was proprietor of a workshop in Seligenstadt. He traveled to Halle for commissions, and, although he was apparently a Protestant and a supporter of Martin Luther, he executed several commissions for two bishops of the Mainz diocese. Grünewald's earliest datable work is the Mocking of Christ (1503; Alte Pinakothek, Munich), a colorful, vehemently expressive painting demonstrating his ability to create dazzling light effects. 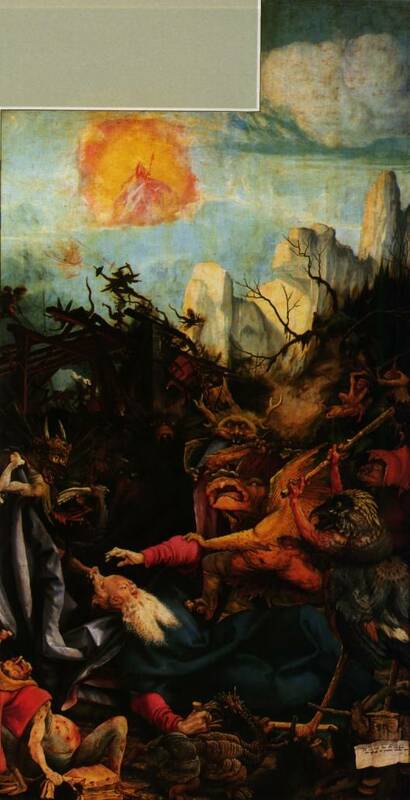 The painting depicts Christ blindfolded and being beaten by a band of grotesque men. The figures are thick-bodied, soft, and fleshy, done in a manner suggestive of the Italian High Renaissance. 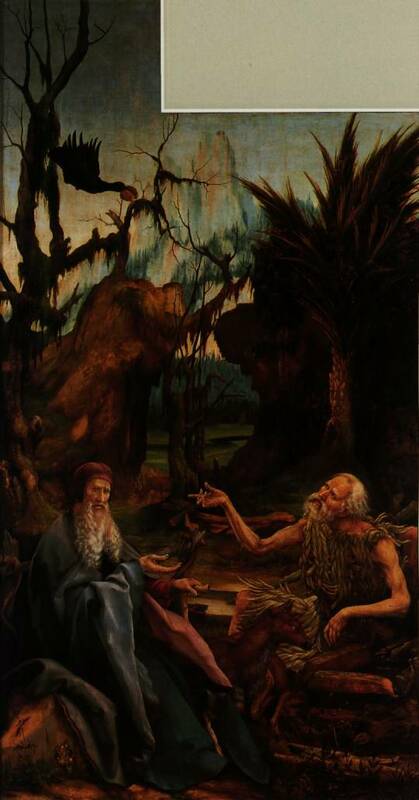 Elements of the work also show Grünewald's assimilation of Dürer, specifically his Apocalypse series. Different from High Renaissance idealism and humanism, however, are Grünewald's uses of figural distortion to portray violence and tragedy, thin fluttering drapery, highly contrasting areas of light and shadow (CHIAROSCURO), and unusually stark and iridescent color. It is these elements, already in evidence in this early work, that Grünewald was to develop into the masterful, individualistic style most fully realized in his Isenheim Altarpiece. 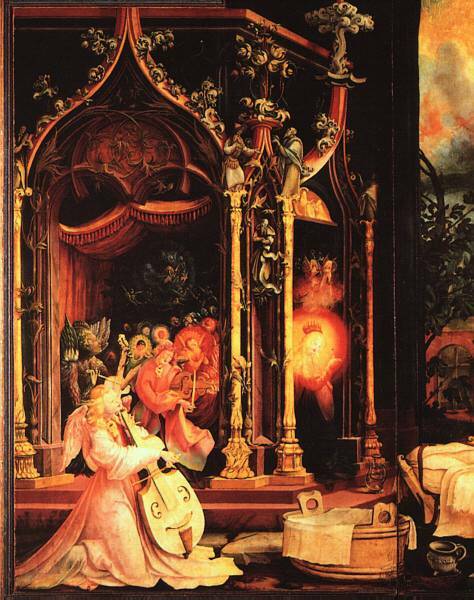 The final flowering of the Gothic came relatively late, in the work of the German artist, Matthias Grünewald (his real name was Mathis Neithart, otherwise Gothart, 1470/80-1528). He was possibly an exact contemporary of Dürer, but while Dürer was deeply influenced by the Renaissance, Grünewald ignored it in his choice of subject matter and style. Much of his work has not survived to this day, but even from the small amount that has come down to us, it is possible to see Grünewald as one of the most powerful of all painters. No other painter has ever so terribly and truthfully exposed the horror of suffering, and yet kept before us, as Bosch does not, the conviction of salvation. His Crucifixion , part of the many-panelled Isenheim Altarpiece , is now kept in Colmar. It was commissioned for the Antoinite monastery at Isenheim and was intended to give support to patients in the monastic hospital. Christ appears hideous, his skin swollen and torn as a result of the flagellation and torture that He endured. This was understandably a powerful image in a hospital that specialized in caring for those suffering from skin complaints. The more accessible Small Crucifixion engages us very directly with the actual death of the Saviour. The crucified Lord leans down into our space, crushing us, leaving us no escape, filling the painting with his agony. We are hemmed in by the immensities of darkness and mountain, alone with pain, forced to face the truth. The Old Testament often talks of a ``suffering servant'', describing him in Psalm 22 as ``a worm and no man'': it is of Grünewald's Christ that we think. In this noble veracity, Gothic art reached an electrifying greatness.